Bookride: Filson Young. 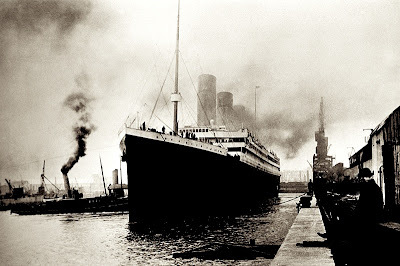 Titanic, 1912. Filson Young. TITANIC. Grant Richards, London 1912.
about prostitution 'The Sands of Pleasure' (much admired by Jean Rhys.) Later James Joyce was disappointed when Filson's publisher Grant Richards failed to persuade Filson to write an introduction for the first edition of Joyce's collection of stories, Dubliners, which Filson had been one of the first to praise when the manuscript had reached him in his capacity as Richards' reader. A TV play based on the book was not broadcast in the early 1930s due to protests from relatives - in our time movies about 9/11 came out in the first 4 years. Talking of movies the 1998 Titanic movie certainly affected prices on this book and they have probably halved since then. Movies rarely have that effect on prices, but if the movie is good enough or big enough it can happen. VALUE? Several copies at ABE (including ours) at £280 -£420 but I am told that copies regularly go through Ebay at half my lowest estimate, although a fine copy would probably buck the trend. It was a best seller in its day and is not scarce. 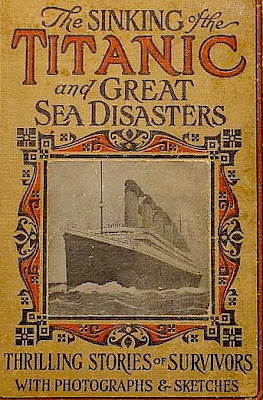 The big money with Titanic books goes for the journal 'The Shipbuilder' that featured the mighty ship in it's Midsummer 1911 issue and, fatefully, had pictures of it's maiden voyage in 1912 - an issue which hit the stands before the disaster. They also issued a 'Souvenir' issue after the disaster. All of these can make over a $1000 and often £1000+ although they do show up every now and then, the April 1912 one being the most difficult. Interesting sale last nite out of Stamford Auctions. Only a few dozen books among a thousand lots, mainly furniture and art pulled from no doubt high-class Connecticut estates. but apparently the books weren't overlooked. The Waste Land made $15,000. This appeared to be in good condition (I didn't see it, only the photos online), with the flexible boards and "mountain" including the "a". So now I'm more confused. I guess the "a" is not evidence of priority in the first issue? or else this was an absolutely pristine copy. A somewhat bumped Finnegans Wake went for $6500, fair enough. But I'm kicking myself for only watching and not bidding online when Pyne's History of Royal Residences went for only $3000. (The eBay LiveAuction screen worked quite well, bids seemed to track in real time.) The volumes looked nicely bound and clean, with all plates present. Shouldn't this be at last twice that amount?